I had such a nice walk around by the swimming pool tonight. It's a lovely time of year for walking - cold, foggy, quiet, magical. You can sometimes get to feel like you're the only person alive in this dark dark world. To the young guy who just drove past the swimming pool - and me - at a speed where he could barely keep his wheels on the road, I would just say this. It's such a lovely winter's evening, try not to die on it. And, if you must, try not to take me with you. When I was on the ambulances, I'd often be coming home at three or four in the morning. I love that time of night, few (if any) cars on the roads, practically no people around. You can imagine that you are the only person in the whole world very easily. I treated it as my 'come-down' time, a time to reflect on everything that had happened in the shift, to unwind before I got home. Good memories, thanks for reminding me, Ken! You know, it really is a wonder that you don't have more pedestrian/road deaths in Ireland. Your country road speed limits are insane! 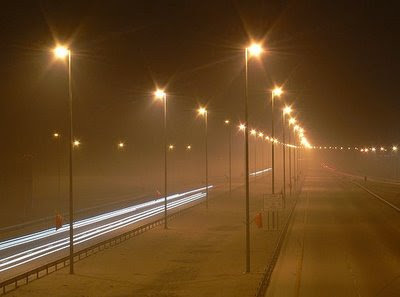 100/km an hour that winds around a million times and has no street lights?!? Be careful walking out there Ken! The world will be a gloomier place without you! It's a beautiful picture captured. Loved it! "We must be going somewhere." "No, we're just going fo a walk." "Because it's good to walk." There's also a wonderful little science fiction story called, if memory serves me right, 'The Pedestrian' where a man goes for a walk and ends up being picked up by a robot police car who assumes he's a criminal because no one goes for walks anymore. I pity any fool who would harm you while you are walking. There is an entire blogiverse that would hunt him down, to tar and feather him! None the less, be careful! Smell the roses , Ken, yes. I, too, sometimes forget this. thanks for the reminder. And stay clear of these reckless drivers...lol...take care. That photo has a eerie look to it. To me it looks as if Freddy Kruger could jump out there at any moment. Maybe you should not just be wary of the traffic. Seems like a fair request. Did you see how well In Bruges did at the Golden Globes? Really glad you're still with us, Ken. Now you see if we had my way and cars were outlawed we wouldn't have this problem...ok...we'd have something else. Andy: I always think of you as 'being on the ambulances'. I think your experiences brought a visceral quality to your fiction writing that I hope is still coming out - the stuff I read was *very* good. Jim: Your dialogue snippet is great! One memorable aspect of my stays in America was the funny glances out of cars I used to get in whatever suburb I was staying - and walking around - in. Dave: I feel your concurrence Dave, I really do. Jena: I will dodge the drivers for as long as I can, I promise. Lyndi: I think the photo has an eerie quality too. I think the midnight walks can sometimes have that eerie quality which I must confess I treasure. Matt: Yes 'In Bruges' stands up to some scrutiny, I do believe. Two old comrades of mine were in the nominees, Martin McDonagh and (winner) Simon Beaufoy. I_want_my_turn!! Jakill: Thanks :) I'm glad to be here too. Hahaha merely a typo but upon reflection its not entirely inaccurate... you are a lot older than me and unless you're immortal, sadly I will experience a world without you and I know it will be a gloomier place when that happens! !